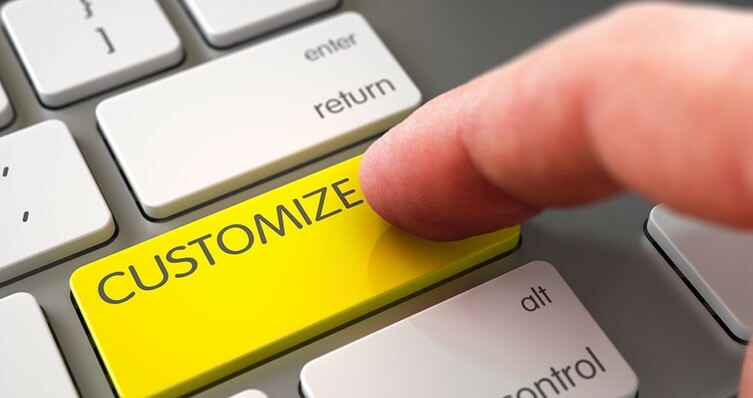 “Customization” can be a dirty word when it comes to software implementations. Ten years ago, a customization could mean hours of consulting and coordination among the business owners, the functional consultant and a software developer — just to define the requirements and to plan how the customization would be developed. Then you had to develop it, test its functionality, create a plan to roll the change into production, and finally — a few weeks or months later — actually move the new code into production. So much time was wasted in the process due to the technological constraints of an older software platform. Much of the time devoted to software customization was not substantially valuable to the business, but it was necessary to meet functional needs. To be honest, the need for customizations was great for our consulting business; it led to a tremendous amount of additional work with our client base. Unfortunately, the value derived from such time-consuming customizations was sometimes minimal, and results were just cosmetic in some instances. Our customers obviously perceived value (as they were willing to pay for the work). But these clients, like most businesses 10 years ago, were victims of the circumstances of the times. Ten years ago, software platforms weren’t built to be easily customized. But my, how the times have changed. Modern ERP platforms, like NetSuite, come enabled with simple customization toolsets that allow users to track business-specific information that isn’t captured inherently in the core platform. Even for more intensive customizations, user-friendly toolsets enable our team to deliver value to our clients in days — not weeks — which ultimately saves the client time and money. For a real-life example, consider a company that services boilers. They have service contracts and projects to install, repair, and/or replace boilers for buildings in a predefined geographic area. They have key components they need to track about the building, the boiler and the location of both. Further, the boiler may have other equipment or parts they need to track so a technician can properly diagnose the problem and repair the boiler. There are field-service solutions with this type of capability; but in my experience, they always need to be modified to track business-specific equipment. And typically, the field-service application does not integrate into the accounting and inventory management system. In older ERP or business management systems, there was no easy way to track this type of information. You could certainly track the customer and the service, and then bill that customer — but good luck tracking detailed information on the boiler and building. Fortunately, modern ERP systems, like NetSuite, make this type of functionality possible. Alternatively, if you choose to use a third-party field-service application, the integration can be much more robust and manageable. In the example above, in NetSuite you would simply define a building record type and associate that to the customer entity record. From there, you create a boiler record type that would be associated with the building record. While it may seem like a highly complex process, it can be accomplished in about an hour. Plus, with NetSuite’s document management structure and support for images, technicians can quickly and easily access schematics or pictures of the building and boiler that have been uploaded to the system. Something that five years ago would have required a system add-on — or worse, a separate application that had to be integrated — can now be efficiently and effectively incorporated into a core business system. And, if an integration is required, it is much less cumbersome with modern development platforms. The outcome is more flexibility for users and reduced risk to the business. With NetSuite, all parties (from the executive team to the service technicians on the shop floor) can access the same information in one system to drive business decisions. Users can have instant visibility to financial information, customer information, technical issues and other operational data (as allowed by management) to help everyone make smarter decisions that are aligned with company goals. Companies that adopt systems like NetSuite have a competitive advantage because they can continuously streamline and refine business processes. NetSuite provides two major functionality releases during each calendar year, allowing organizations to adapt their systems to changes in their business and/or market conditions. With modern EFP systems, businesses find that information is a powerful decision-making tool. If it’s time for your business to move to a more flexible, adaptive and cost-effective platform than you’re currently using, please give us a call. We’d be happy to demonstrate how NetSuite’s capabilities can help you manage your business. Considering a merger or acquisition? Why pay legacy ERP maintenance fees? Does your business have a valid buy-sell agreement?